The Mob & Las Vegas / Las Vegas Legends / TVparty! Has there ever been a tune that typified the Go-Go years in Las Vegas better than the title song from one of Elvis' biggest motion picture hits? 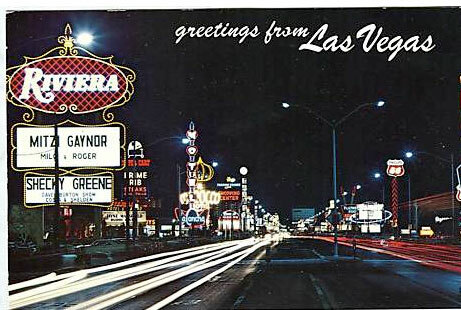 'Viva Las Vegas' wasn't just a big screen hit (14th in 1964 box office receipts) it reached #29 in the Top 40, selling more than 500,000 copies to go certified Gold. It was acually released as the b-side of 'What'd I Say' from the same film. Oddly Elvis never performed the song live, not even during his sold out runs in Las Vegas in the 1970s. You would have thought it would be a natural! Elvis may not have sung it live but dozens of performers have in the ensuing years and the song was adopted as the victory theme for the NHL's Vegas Golden Knights. The film's co-star Ann-Margret did a take off of 'Viva Las Vegas' in the motion picture 'The Flintstones in Viva Rock Vegas' in 2000.